TETRATAB Casepad IP65. Photo: © TETRATAB. In June of 2014, we spoke with TETRATAB about their CASEPAD ruggedized tablet. 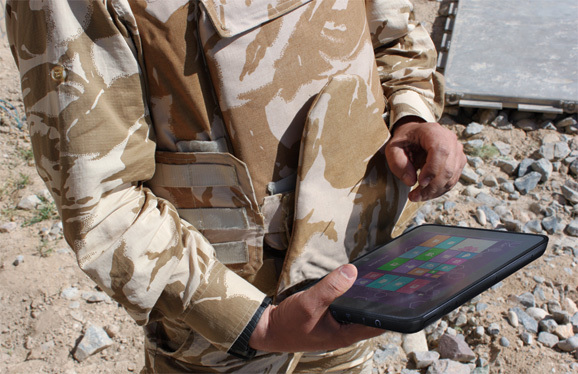 The CASEPAD is one of the thinnest, lightest and most ultra-portable rugged Windows 8.1 Pro tablets available. It is almost the same size as most non-rugged ‘consumer’ tablets – yet it is IP65 certified water and dust-proof and tested to withstand a 1 metre drop onto concrete. The ultra-rugged version currently being tested for the warfighter can be completely immersed in water for prolonged periods and still be totally serviceable, with an added optional MIL Standard case which increases the drop height to 1.8 metres. Since our last issue, the CASEPAD has been rigorously tested by the military for inclusion in the UK’s future soldier programme. The CASEPAD was amongst 20 ruggedized tablets tested and was one of only two offerings selected to advance to the next phase trials. In other words 8 rugged tablets did not pass the test. Q: Could we talk about the trial undertaken by the military, what its aim was and how the products were tested? A: The Specialist Combat trials team took rugged devices from 8 manufacturers to test to see if they would meet the needs of a future dismount requirement. The products were tested in swamp, primary, secondary jungle and deciduous woodland terrain. the only unit that would work direct from a USB solar charger. Q: So tell us about TETRATAB’s entry into the “battle-tab” arena, what makes it unique? A: Our product strategy is to concentrate on the four key basics - power; connectivity; usability and survivability. Many device manufacturers concentrate on functionality, cosmetic design and other enhanced factors that are not always relevant to these types of users. The CASEPAD is designed to give sustained power stamina, to have reliable comms connectivity (where necessary), and then to be tough and intuitively usable. Tetratab is committed to reducing the burden of the dismounts weight that they have to carry in theatre and we are currently on a new platform curve that makes our units the lightest in class at this time. We are to engage with other end users and to make multi-functionality a prime capability and further enhance the reduction in weight that a dismount has to carry. HexMount system on the CASEPAD. Photo: © TETRATAB. Q: Right, but I would imagine one of the key concerns would be interconnectivity and interoperability? A: Yes, because the CASEPAD is Microsoft Windows® and Intel® based, it is already 95% compatible with most existing military systems. However, we can also supply the CASEPAD with an Android operating system if that was ever a military customer requirement. But one of the key elements in the next phase of the trials is going to be ease of use and suitability for military vehicles – thereby making this a complete end to end legacy system. The CASEPAD is fitted with our integral ‘HexMount’® system which allows almost instant one click docking and undocking from any type of military vehicle, aircraft or boat. TETRATAB have developed the HexMount system in conjunction with UK police forces and other secure rugged mobile workforce users, but we have also designed the electronics to support 12v, 24v and 36 volt inputs, thereby allowing installation in the widest range of cars, trucks, military vehicles, boats, aircraft and any military field batteries. Q: So how would this support other vehicle based military applications? A: We already have ‘in vehicle’ CASEPAD installations supporting ANPR (auto licence plate recognition) and video recording - with up to 6 cameras, video recording and speed enforcement inputs. These systems can accommodate conventional and infrared cameras, mounted front and rear in a police cruiser. This allows onboard systems to monitor traffic approaching at 60 MPH on a patrol vehicle already travelling at 60 MPH – thus with a 120 MPH relative closing speed. Working through the HexMount and the CASEPAD tablet and 3G/4G/LTE (or TETRA) communications, these systems can check licence plates against national ‘watch lists’ in real time to identify stolen or uninsured vehicles or suspect intelligence targets. Q: So presumably this type of ‘in vehicle’ video capability could provide a 365 degree view of the vehicle and total situational awareness back to command. A: Exactly, there is a wide range of rugged cameras with IP ratings, infra-red and night-time capabilities fish-eye cameras that can be used both inside and outside the vehicle to do exactly that. Q: Which means the people at command could actually be seeing more in and around the vehicle than anyone within, or driving say an armoured vehicle, so that greatly improves situational awareness to those in the vehicle, which is particularly important in an armoured vehicle where visibility can be limited. A: Right! And from our perspective the other great advantage with a military vehicle is the rapid ‘one click’ HexMount docking. Currently when operations are compromised or in jeopardy with ‘fixed’ in-vehicle computers, crews in the field often have to “shoot the computer” if they have to ditch – in order to protect sensitive information stored on the computer. With the CASEPAD and HexMount the crew can just ‘grab and go’ and pocket the tablet. So they not only retain and protect valuable data but they can also maintain full computer facilities whilst on foot and connectivity to command. Q: Great, but of course beyond interoperability, and ruggedisation, military users will have some very specific requirements, particularly involving privacy and security. ‘Man-down’ one-push buttons – to remove the need to deal with touch screen or key strokes. Q: And off the shelf, it does have built-in positioning and GPS, yes? A: The CASEPAD has both GPS (USA) and GLONASS (Russian) GPS receivers – thus giving highly reliable and extremely accurate positioning. Q: As the militarized version of the CASEPAD is being considered as the “Battle-Tablet” for the UK Future Soldier Platform, what about interoperability with helmets, other screens, etc. that are wired into the combat vest. Does it just connect? A: The HexMount system is not simply confined to vehicle integration. It is also designed for integration into battlefield clothing, rucksacks, ballistic vests and virtually any other type of wearable or portable military equipment. 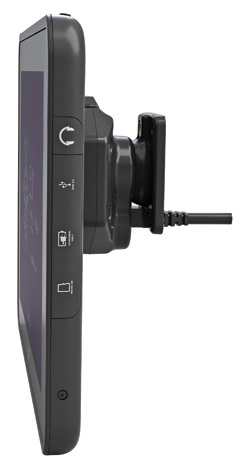 The HexMount unit can be riveted, stitched or screwed into any surface but then provides one-click mounting and demounting of the CASEPAD tablet - and can provide robust power and USB connections to supplementary kit such as batteries, helmet cameras or peripheral communication or printing devices. The HexMount unit allows a compact fixing footprint – but it has already been tested to a 90KG force loading – thereby ensuring that the CASEPAD tablet will always remain firmly fixed to the dock and thus firmly fixed to the soldier.